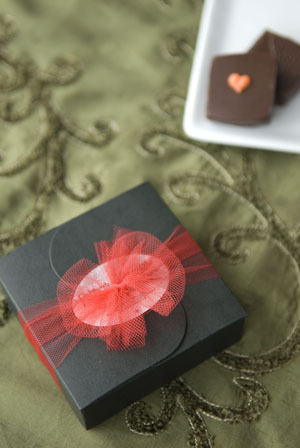 Patricia makes chocolates with style and substance. From top clockwise, in box: Lemon Cardamom, Michigan Blueberry, Tawny Port Raisin and Blood Orange. All photography by Corey Lugg | THE NIBBLE. This is Page 4 of a six-page article. Click on the black links below to visit other pages. There is a real Patricia behind these chocolates. She and her husband Paul worked as school psychologists for thirty years, proving that they’re more than tough enough to work with as temperamental a material as chocolate. With training at The French Pastry School under her belt, support from neighbors, and the necessary municipal and county permits firmly in hand, the couple built a commercial chocolate kitchen in the lower level of their home in Grand Haven, Michigan. Patty Christopher has been turning out chocolates ever since, but these aren’t just any old confections, as you can see from the photos. They are carefully decorated, well-conceived examples of the chocolatier’s art—one might think she’d been an artist rather than a mental health professional. If you prefer something more up-to-date, there’s an Earl Grey Tea chocolate, in which the tea is infused in a blend of milk and dark chocolates and covered with dark chocolate. The circle and square design motif is Grecian, in white and Aegean blue. 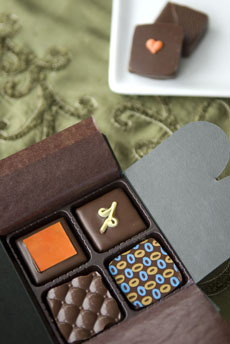 Among Patty’s newest creations is a dark chocolate-enrobed ganache containing puréed lemon and green cardamom (shown in the photo at the top of the page with the yellow script “L”). Talk about exotic! Most of this business is wholesale; Patty sells to a very limited number of boutiques in the Midwest. There’s no retail store and no online ordering. You must call or e-mail to order, but doing so is more than worth any minimal extra effort. Above, a tribute to the home state, Michigan Blueberry: dried Michigan blueberries, Maine wild blueberry wine, vanilla bean and cream in dark chocolate. 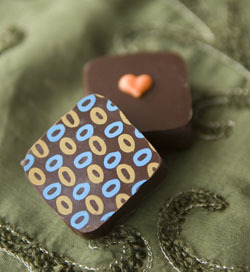 Snuggling behind is Passion Fruit Mango, passion fruit and mango infused in a creamy milk chocolate caramel and dipped in dark chocolate, decorated with a heart.